Sorry for the delay in posting the recipes from this week’s take-aways. It’s been a hectic time for Jozi (Un)cooked. In addition to take-aways this week, we had several events to cater. And then there was Johannesburg’s first raw vegan potluck, which was a wonderful event. I’ll post more on that later. This week’s main course, kung pao lettuce cups, was based on a meal they serve in Chinese restaurants in the US. That dish is cooked, and usually has chicken. 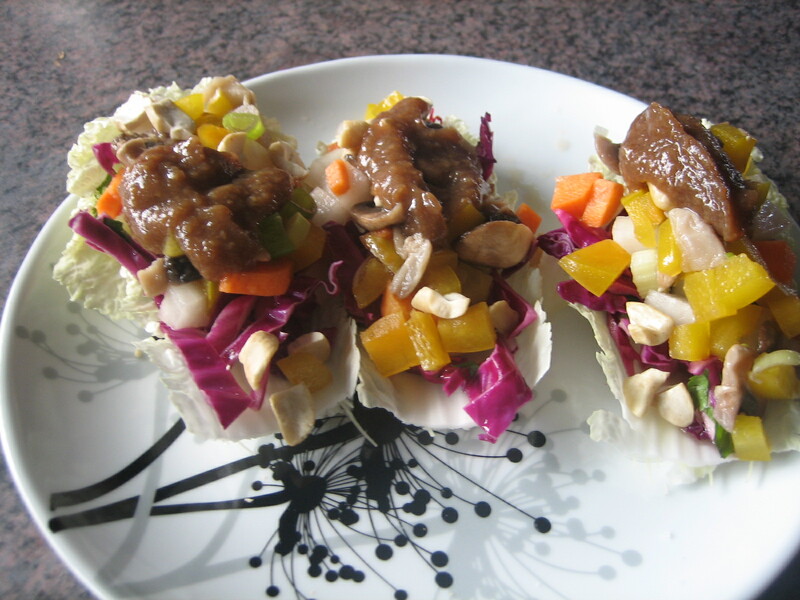 I made a raw version with marinated Asian veggies and tamarind sauce on top. It was delicious. 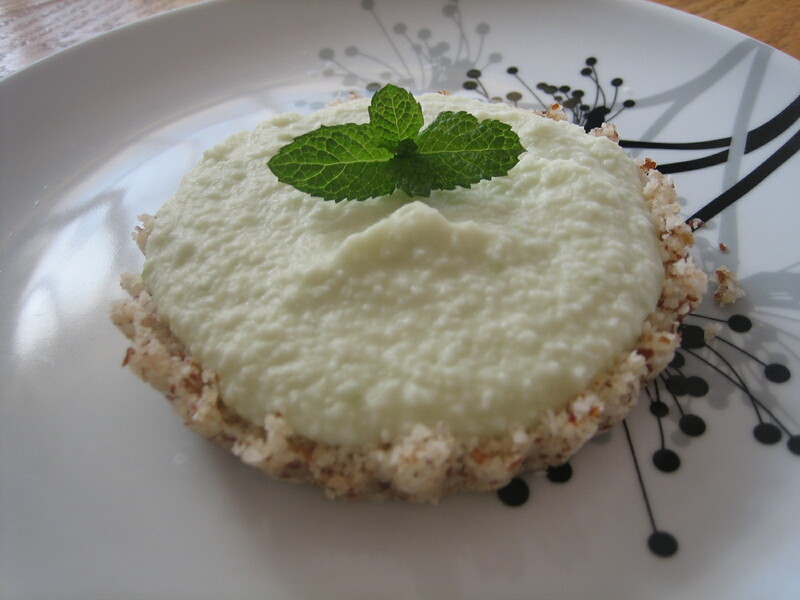 For dessert, key lime pie– one of my childhood favourites. I think a more appropriate name might be coconut lime pie, since I used regular limes, not key limes. I am having a bit of a love affair with young coconuts these days, so keep watching this space for more coconut recipes. They are incredibly good for you, and so tasty. 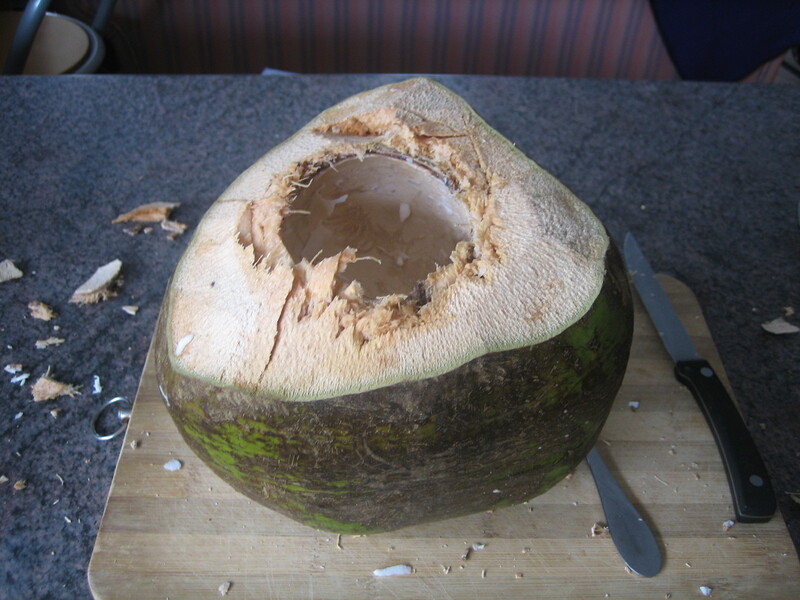 Plus by the time you manage to crack a coconut open, you feel like you’ve earned the water and “meat” inside. or overnight. I like to put vegetables of similar thickness together, and keep the red cabbage separate so everything doesn’t turn pink. Wash Chinese cabbage leaves, and chop off the rough bottom. Fill each leaf with the mix of vegetables. Sprinkle with chopped cashews and top with tamarind sauce. Instructions: Make crust and press into the bottom of a pie tin or several mini springform pans. For filling: Blend coconut meat and water in blender, until they make a smooth cream. Add in avocados, lime juice and zest, agave, vanilla and salt and blend until smooth. Add in coconut oil, blend again. Pour filling into crust and set at least one hour in the refrigerator. The longer it sets (e.g. overnight), the better it tastes. This entry was posted in desserts, main course, Raw Food, recipes, take-aways and tagged johannesburg, raw chinese food, raw key ime pie. Bookmark the permalink.